Remember A birthday for bear? I wrote about it back in April. 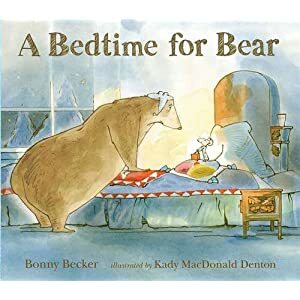 We love the books in this series so we were very happy to come across A Bedtime for Bear on a recent visit to the library. The Bear and the Mouse are not best friends and when The Mouse invites himself for a sleepover and turns up one night, the Bear is not so happy. Because he needs absolute quiet at bedtime. He likes to set out his glass of water, adjust his nightcap, fluff up his favourite pillow and then drift peacefully off to sleep. But the Mouse, small and grey and bright-eyed, finds it terribly hard to be as quiet as a mouse. Another lovely bedtime story by Bonny Becker. The illustrations look delightful.. I will look out for these on our next library visit.